CSR Europe is the leading business network for corporate social responsibility with around 75 multinational corporations and 27 national partner organisations as members. Business in the Community mobilises business for good. Its members commit to improve the way in which they manage their resources. be that their people or the planet. Its power is the unique platform this creates for collaborative action. A high profile global network , BSR works with more than 250 member companies to develop sustainable business strategies and solutions through consulting, research and cross-sector collaboration. The World Business Council on Sustainable Development (WBCSD) is a CEO-led, global association of some 200 companies dealing exclusively with business and sustainable development. The Small Business Consortium was established in March 2002 in response to feedback from small and medium size business (SME) owner-managers who asked for a collaborative approach to corporate social responsibility by the main SME stakeholder organisations. There's a lot of really good information out there amongst the mess. 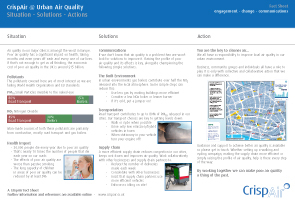 Click the image above for the low down on air quality in the urban realm. If you have found the 'gold' and want to share it, whether it be signposting or best practice, please let us know. Some useful links are provided on the left, but if you have a specific question please do not hesitate to get in touch.